Join PDAN and Mark Komrad M.D. 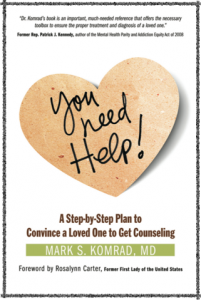 on October 21st, 2015 from 7:00-9:00pm EST for a two-hour, interactive webinar aimed to help guide you to convince a loved one to get counseling. Just about everyone knows a relative, friend, or coworker who is exhibiting signs of emotional or behavioral turmoil. Yet figuring out how to reach out to that person can feel insurmountable. Getting a troubled person through the door to be evaluated properly, so appropriate treatment can begin is sometimes the biggest challenge. This webinar will review why people often don’t get professional help on their own and some of the consequences of not getting treatment. Then Dr. Komrad will give you ideas about how you can work with a family member of friend to get treatment started. Methods of effective communication and persuasion will be reviewed. There will be focus on practical considerations, such as how to chose the right time and place, how to work with key allies, and how to move from persuasion to “therapeutic coercion” that harnesses the often under-used power of family relationships. 4. Either login to your paypal account or click “continue” to pay without an account. 5. Send an email to seminars@pdan.org confirming your registration!